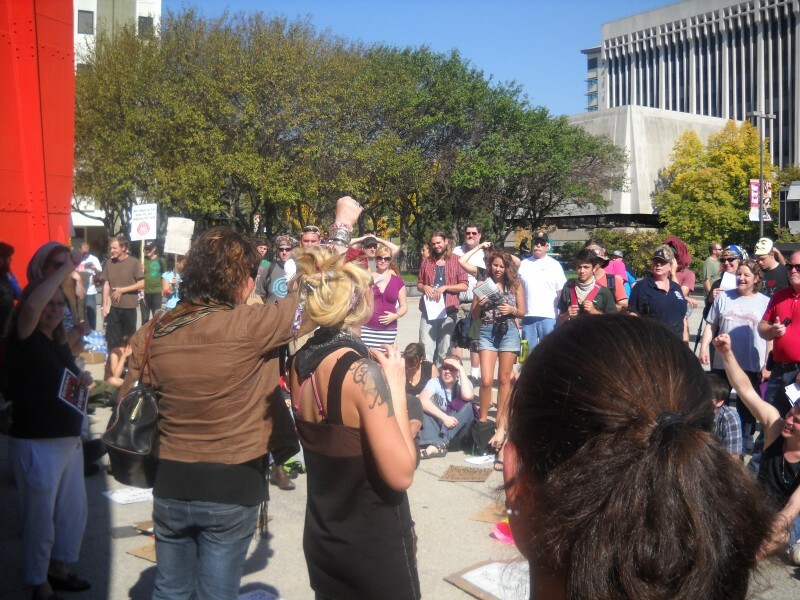 Writers often have trouble naming what the Occupy movement is about, so it’s no surprise that “economic frustrations” falls short. This “leaderless resistance movement,” (as quoted in the GR Press article by Garret Ellison) has taken criticism for being indirect and for having no clear set of demands. 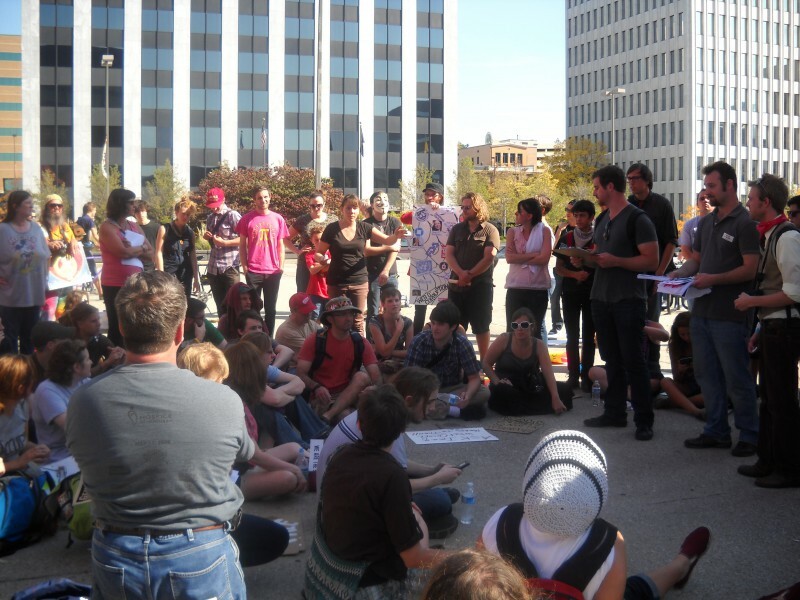 But the Occupy movement – which has spread from Wall Street to several cities in Michigan – has one clear goal: a revolutionary change in culture. Out with dominance; in with inclusion. Out with a global empire that believes it is natural and orderly to make decisions for all; in with citizens being entrusted with and respected for their right to a vision and a voice. Out with the imbalance inherent in all sorts of lopsided percentages: the richest 10% controlling two-thirds of America's net worth, the top 20% controlling 85% of our wealth, and in recent decades, 94% of all new wealth generated by our economy going to the wealthiest 10%. 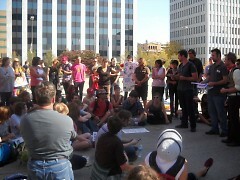 In the words of a young man I sat next to after the Saturday, Oct. 8 four hour general assembly, “This is only the beginning of a whole new way to do things.” The assembly was taking a break to revise flyers, crossing out “Calder Plaza” and writing in “Ah-Nab-Awen Park” as the location for Occupy Grand Rapids. (Flyers had been printed in preparation, before the group came to a consensus about where and when to occupy.) “This is a whole new way to bring about change,” he reiterated. Three hundred fifty people gathered on the plaza’s sun-baked cement, taking turns moving in and out of slim waves of shade offered by the shadow of the city’s beloved Calder, La Grande Vitesse. People of all ages and approaches came together – voicing and listening and sometimes becoming impatient with the talk-talk-talk (about 120 were still standing by the end) – but facilitators managed to maintain openness. 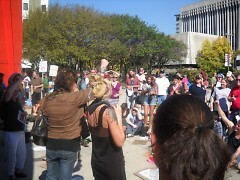 Everyone present was encouraged to speak, to propose actions, to participate in decisions. Corporate America, of course, would never allow such inefficient dynamics. Many movements have tried to break hierarchal communication models. 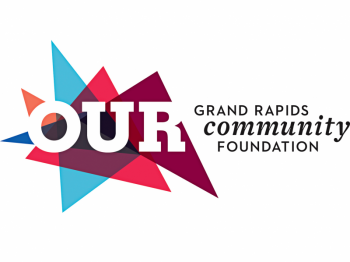 In open space meetings, facilitators seek topics from the whole group, then ask members to gather in sub-groups according to each person’s topic of interest. The talking stick (adapted from Native American practices) allows everyone in a circle to talk, but only as long as each person holds the stick in hand, and facilitators keep the stick moving. It’s the general assembly and its human mic that I want to call attention to. It's important to talk about why maintaining the openness of the process and its purposeful refusal to let any number of voices dictate the group’s actions is vital to this whole new way of doing things. A quick description of the general assembly. The first goal is to create a meeting agenda. Items for discussion are brought forth from the whole group, and the process is protected by a few key principles. There are no leaders or decision makers. The meeting begins with a few facilitators demonstrating the rules for discussion. A set of hand signals (rather than shouting out) lets facilitators know when the assembly agrees or disagrees with proposals and concerns. Once items for discussion have been agreed upon, rounds of discussion begin, item by item. For each discussion item or decision to be made, anyone who wishes to speak signs up or “gets on the stack.” Volunteer facilitators (who change with every meeting) hold lists of names of all who wish to speak and one by one, individuals come forward. Each person speaks in short phrases, like “I hope the group will consider,” and the whole group repeats, “I hope the group will consider.” In this way, each person’s voice is carried and amplified by the crowd. Yes, it takes time for each person to stand up and speak, to wait as the group carefully echoes each short phrase. There were a few passionate protestors at that four hour meeting who could not wait – voices that broke into the process and sometimes threatened to take over. But thankfully, there were people at the assembly who understood something larger than simple talk-talk-talk was happening. And I knew exactly what she meant. As each person’s words passed through the bodies of all those present, there was instant agreement on the sanctity of the right to be heard. Yes, waiting for everyone to speak is slow and sometimes messy. People bring up broad-ranging concerns: homelessness, student loan debt, engaging the LGBT community, smoking in or out of the assembly. There were times during those first four hours when I understood why three different men in the crowd kept urging everyone to stop talking and start the protest. I, too, identify as a person of action. But I was glad to be in the company of several women (and men) who kept reminding everyone of the importance of the process. Shouting over comes from a position of privilege. Shouting down is the language of dominance. If there is anything other movements have to teach us, it must be this: No single voice, no matter how passionate, should be deemed more worthy of being heard. 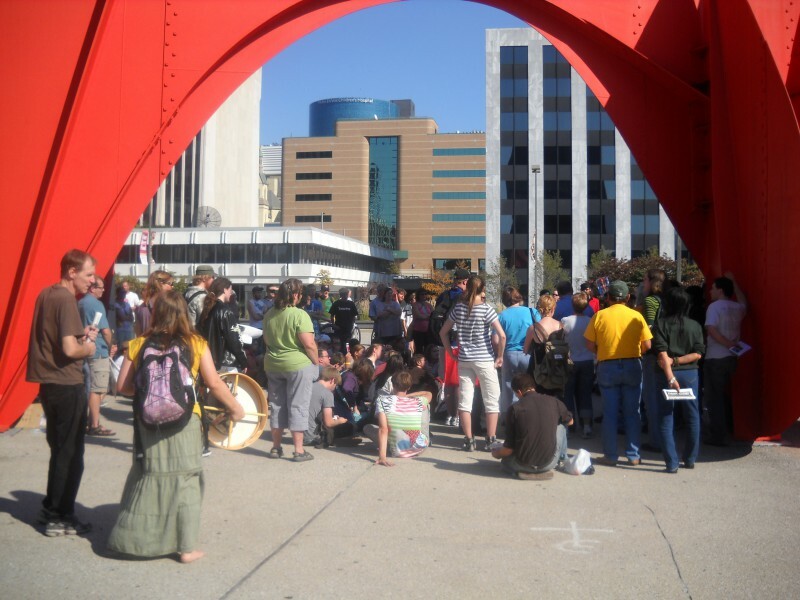 So yes, by the time the 120 people remaining decided when the Occupy Grand Rapids movement would begin (now), and at Ah-Nab-Awen Park (based on two rounds of ‘where’ discussion), and how - with an initial march through Grand Rapids – there was a strong sense of unified purpose. To all those inside and outside of the movement who criticize the process, I say, long live the people’s mic. Yes, there are bumps to be worked out, but let us all remember the value of a “mic check.” The 99% has not yet witnessed or created or lived in a post-dominant, post-patriarchal, post-hierarchal society. No single one of us knows how to build that consensus. Change like that – deep-seated change in our culture - is going to be messy. Progress will stall out as we develop new ways to strike a balance between listening and acting. This whole new way of doing things is bound not to be efficient. It is the corporate world, after all, that has taught us to expect and demand efficiency. First of all, I thank you for this concise and well-written article. I am very greatful that you wrote this. I also have noticed how it forms the way you can present your ideas... the need for effeciency demands that you boil ideas down to their concentrated formulation if you want to keep your audience motivated towards your proposal you have to be fast and persuasive and articulate. I have also noticed (and hear that I'm not the only one!) that my own inner dialogue starts to take on that same pace as I try to articulate my thoughts for presentation to others later. I had to laugh when I realized that I use the "people's mic" in my converations with myself! Thanks for these comments, Scott. So many people are talking about the human mic - pros and cons - especially its powers of reverberation, that I felt the need to write a sort of "ode." In fact, a poet and songwriter I know is writing a poem that he has jokingly called an "ode to the human mic." I've always picked up mantras at different times in my life. I know you won't mind if I borrow yours: "Mic Check!" Thanks for the great behind-the-scenes on this burgeoning movement, I've been craving good updates. I've found excuses for missing out on all of this formative part and this helps me feel it's not too late to get involved. I also read about the human mic in at least one article about OWS and wondered what that was exactly, so your explanation was great. I love that an anti-corporate movement adopts a style of communication and assembly rules that are so vastly different from the hierarchical rules in corporations, it seems very appropriate. There's an inner cynic in me that started wondering which of our already much over-heard community voices was going to co-opt this one. Would it become some sort of flash mob youtube meme, or get used to help a new version of the old political boss get into office? It's heartening to know the foundation of the movement is digging deeper than that. Thanks Maryann! Interesting comments regarding your inner cynic wondering which voice might rise up over all. No process is perfect, and the GA's consensus doesn't mean a large group reaches 100% agreement, but it was heartening to listen to the interest in the process itself. I find it interesting that the human mic, which probably began simply as a way to circumvent rules against allowing protestors to use megaphones and other gadgets for amplification, may have actually helped to unite so many ears and voices.